The Metor® 6S complies with NIJ Standard 0601.02, fulfilling the requirements for corrections and law enforcement agencies. Preset programs which meet the different security levels defined by NIJ are immediately available. Metor® 6S can be integrated with radiation detection capability to combine multi threat detection of both metal and radioactive materials. The configuration enables either gamma or gamma/neutron detection options and is available as a field upgradeable kit. The latest features for advanced security are available on the Metor® 6S. Calibration guard, power guard and ready-state violation all protect against unwanted tampering to the machine. Fully configurable user levels allow for unprecedented control over who can view and change settings on the Metor® 6S. Preset Detection Programs – The Metor® 6S is delivered with multiple preset detection programs for the different levels of NIJ-0601.02 as well as for the detection of small magnetic or non-magnetic items and objects made of mixed alloys, ready to use immediately. 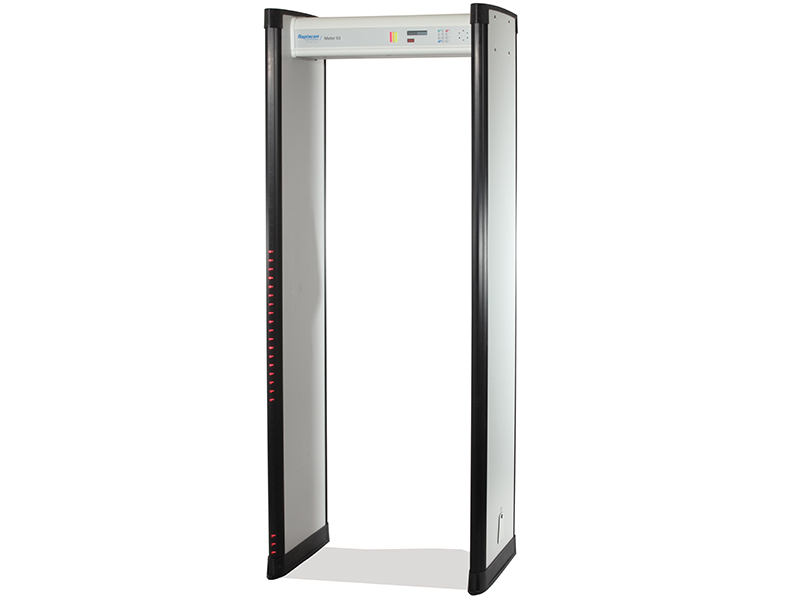 The Metor® 6S has a random alarm function that enables security personnel to randomly choose individuals for an additional security check. Metor® 6S is built with intelligent and virtually invisible traffic counters which are integrated inside the coil panels. Counters are bi-directional with a decrease mode. Alarms, people and alarm rates can all be counted. 20 segment zone display locates the alarmed item(s) on a person quickly enhancing the screening process and throughput. With its immunity to electromagnetic interference and vibration, the Metor® 6S is easy to install in the most demanding environments. Several units can be placed in close proximity to one another, increasing the level of flexibility when planning an installation site.